One of the very first purchases I made that made me feel like a grownup was my KitchenAid mixer. I bought it with Christmas money in January of 2002. I decided on a white mixer at that time, because I didn't want something that would go out of style and I had mostly white appliances. 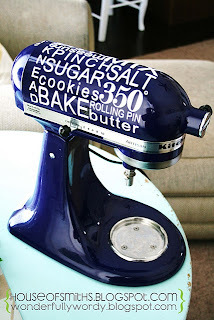 Over the years, I have gotten bored with my mixer and wished for a more classy stainless or black mixer. I probably still wouldn't choose one of the colored mixers because I just don't want to have to think about working around my mixer in the decor scheme of my kitchen. And yes, my mixer lives out on the counter all the time. It's too heavy to put away and I don't have cabinets to spare. I just couldn't justify replacing a perfectly good mixer because I didn't like the color. So, I was so excited when I saw this in my blogroll this week and discovered a very fun new site to browse: Wonderfully Wordy. I've long been a fan of the vinyl words that people are starting to use in their home decor, but never could decide on what I wanted - and wasn't really willing to pay for it. I was so excited at the thought of punching up the love that I have with the functionality of my KitchenAid in a very economic fashion. What took me to the site originally was a giveaway post.....so, first I tried to win free stuff. When that didn't happen, this past Monday I sent Shelley an email, ordered my vinyl and waited impatiently for the mail each day. Shelley was so responsive to my order that it even shipped out the very next day and I had my mixer art yesterday. This morning, first order of business was to accessorize my mixer! Shelley sent me a great little video with helpful tips on application. First, I made sure my mixer was clean and not greasy. I played with placement quite a bit, trying to decide which way I wanted it to go and making sure it was at least reasonably straight, then taped the sheet of letters to one side of the mixer. After that, it was just peeling off the backing paper and smoothing away. The top sheet of paper was a little more crinkly that I thought it would be, but overall a very easy process. And look at my beautiful new mixer! There are a few slightly crooked letters and a few wrinkles, but I'm so very pleased with the result!! Thanks Shelley! On my way to church this morning for our worship team rehearsal, I stopped by a community garage sale. I think they do it fall and spring, but I've always been out of town. Stopped at several other estate/garage sales on the way home and picked up a couple of things, but this was by far the winner of the day. Now I'm watching baseball on TV for probably only the second time on my life (first time being yesterday) as I'm cheering on the Texas Rangers in their bid to beat the Yankees in the ALCS.